I am trying to create this look on an image but not sure what program was used to create it. I have illustrator and photoshop but not sure if there is a filter I could purchase to help start the process. At first this seems to be a quite common "how to triangulate" -case. But it's more complex. The bottles are probably revolved (=lathed) 3D objects made in a 3D program. They are side views, so a competent Illustrator user also draws them quite fast manually. 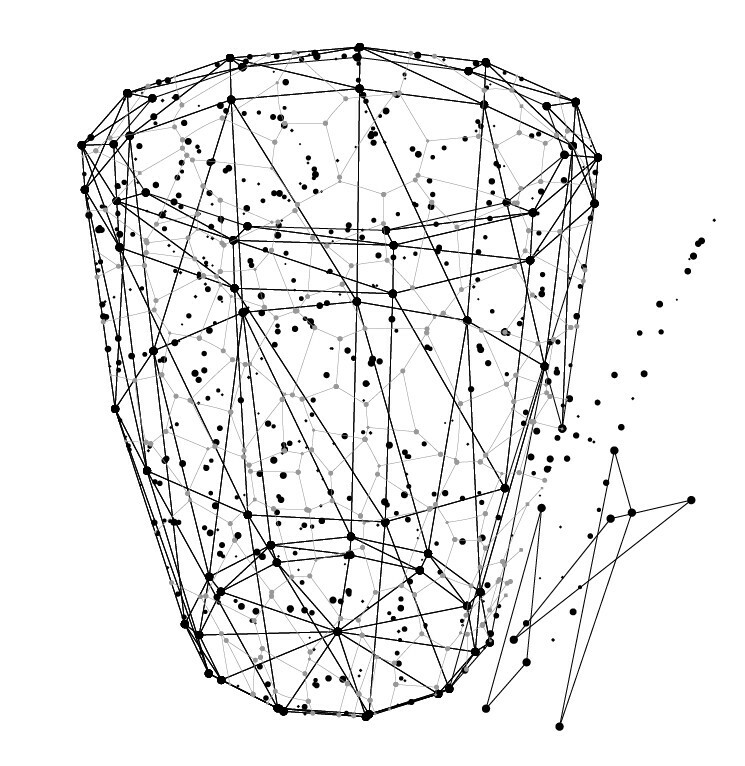 Illustrator's 3D revolve effect doesn't make triangle networks. 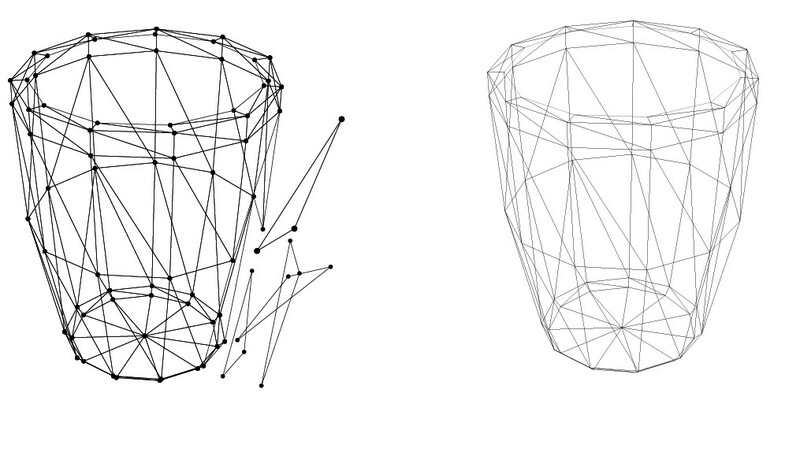 It makes curved wireframes. In theory they can be straightened with Object > Path > Simplify after the result is expanded. The result needs so much manual editing that I see the straightening as a way to get polygonal model only theoretical. Very easily there's too dense and too sparse areas and numerous double lines. Heavy manual editing is a must. But if you can accept the need of heavy editing and do not want it as "triangles only", then Illustrator's 3D is possible. I do not recommend it. Use a real 3D program or draw the shapes manually. 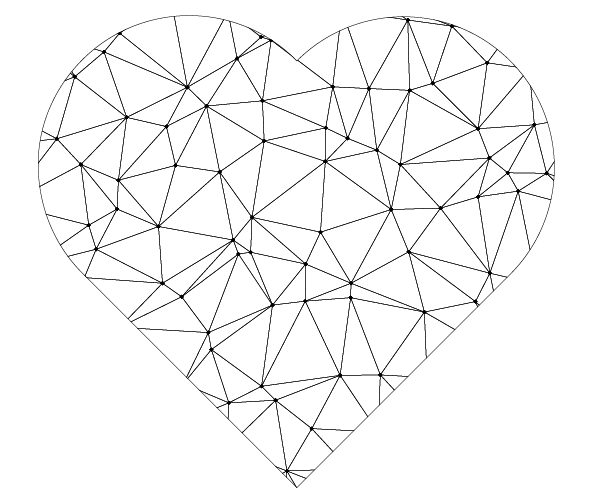 A 3D program can make good coarse enough triangle mesh with minimal work and export it as 2D vector triangle collection. There are several different triangulated versions of the same shape. Part of them can be made in 2D with triangulation plugins and as said previously, also manual drawing is possible. You can make a copy of all triangles to another layer, unite them to one shape with Pathfinder panel and retriangulate it or divide it to polygons otherwise. In a comment User Welz suggested web service Trianglify which generates triangle patterns. I tested it and it worked. But the free version didn't fill my shape with triangles, it only gave a rectangle full of triangles. It was downloadable as SVG and it could be used to divide shapes. Different triangulations have different strokes. Line widths and colors are not same. Some are not lines at all, but dot patterns. Illustrator's Scatter Brush with randomized size and placement generates them easily. Only a filled circle must be inserted to the brushes collection and define to be a scatter brush. Some triangles are filled and some are ripped apart to make splinters. You see also that many triangles have circular dots at the vertices. If one adds circular arrowheads to a triangle which is a closed path, he gets only one dot. You can still have plenty of dots if you set the triangles to have a circular arrowheads in the beginning of a path, because in a mesh the triangles have different starting nodes. You can split all triangles to separate lines with an old trick. 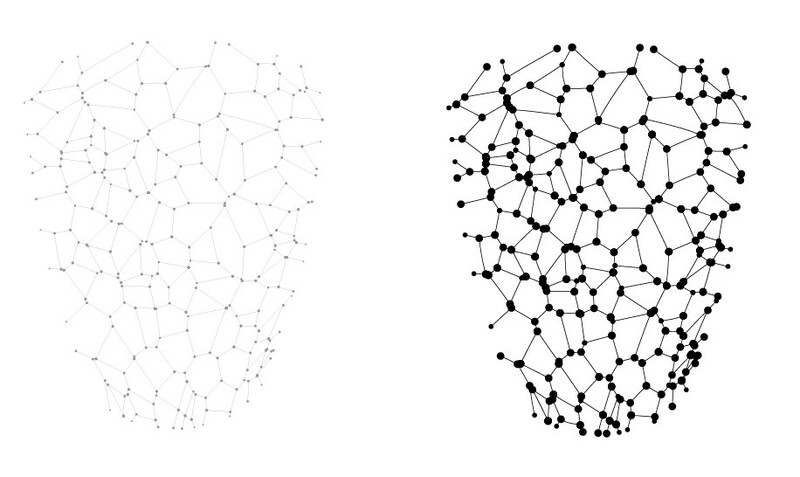 Then every node can get a dot by adding circular arrowheads to the beginnings of the lines. In the left there are a few closed triangles. Add one anchor point to one triangle. It's here in the middle of the red circle. Select all anchors by dragging with the white arrow tool, then deselect the new anchor by clicking it + holding shift at the same time. Tool control bar has now "Cut path at selected anchor points". It vanishes if all anchors are selected. Click it! Select all lines and insert circular arrowhead to beginnings. NOTE: Select align option "Extend arrow tip beyond the end of the path". Dots are centered to line ends and overlapping dots have same place. 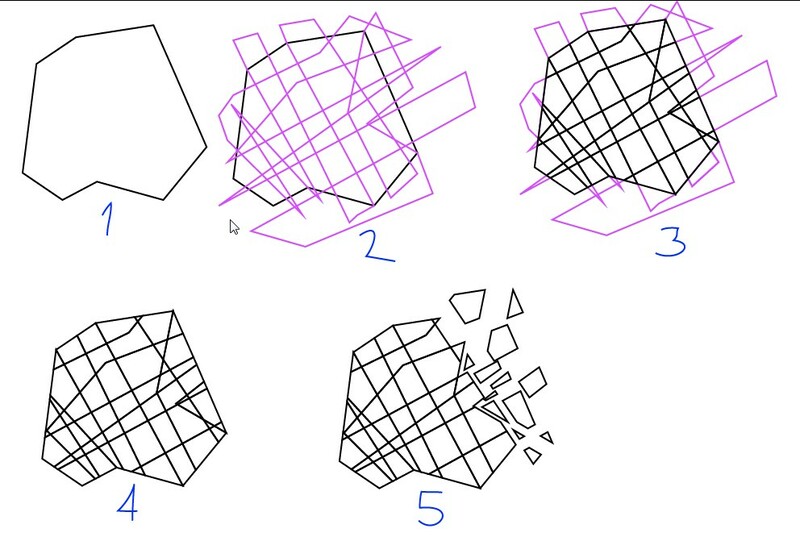 You cannot move nor fill a part of the triangles because they are separate lines. Make a copy to different layer, lock the original and fill the wanted triangles with the Shape builder in the new layer. In the next example three triangles are filled and moved a little apart to show they are separate, Unused lines in that layer are deleted. In the left just one is getting a fill from the Shape Builder. Envelope distortion makes straight lines easily curved, but everything can be straightened with path simplifying. Here the curves are left as is. Finally one splinter has also got the scatter brush. 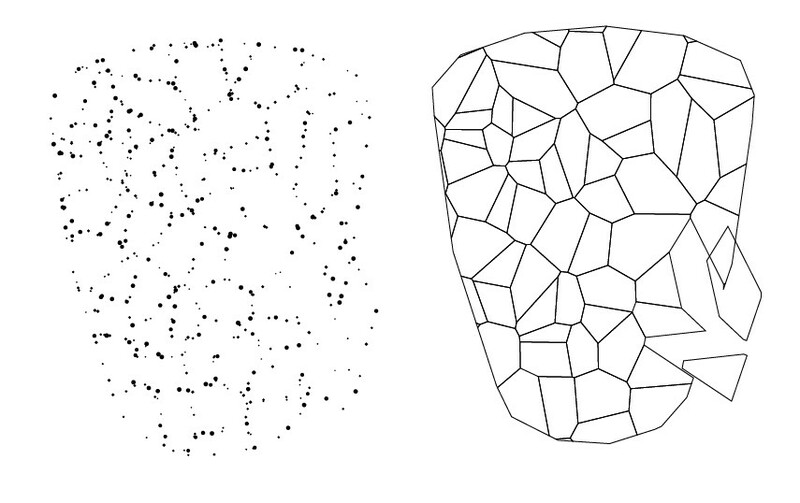 The Voronoi pattern is a fill pattern in Inkscape when it's created into some shape with Extension > Generate from Path > Voronoi Pattern. It must be converted to object with Object > Pattern > Pattern to Object. 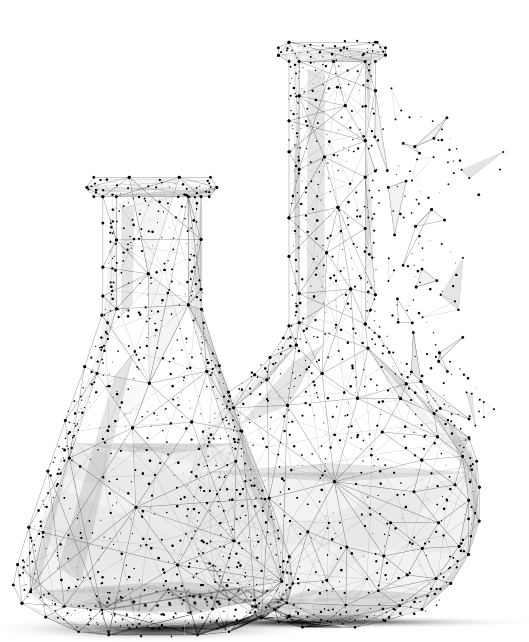 The result is a compound path. All lines become separate with Path > Break Apart. Not the answer you're looking for? Browse other questions tagged adobe-illustrator vector digital or ask your own question. How to create 3D extruded text? Should I use Photoshop or Illustrator for a large print design?